Luv 2 win that rock!!!!!!! 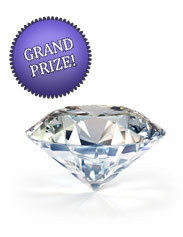 I would love to win this, i love diamonds and love to show them off! What an amazing prize! I entered and I have my fingers crossed! I LOVE DIAMONDS!! AND, ANY JEWELRY IN SILVER AS WELL! GOLD SAYS IT BEST, THOUGH! Would love to win this prize!!! Great give-a-way! Best of luck to all of us! I so would love to win that rock! my mom and me are living below poverty level, both sick, cold hard living,, this would brighten our whole lives. This would be awesome….I’ve been with my fiancee for 11 years,engaged for 7 years and we have 3 beautiful children together, but still don’t have a ring….this would be an awesome win! IT WOULD BE AWSOME TO WIN THIS! Wow, that’s gorgeous! I’d feel like a princess if I was lucky enough to win.. I would love to win that rock. Very pretty things! Need that diamond for the center stone of the ring I bought for soon to be fiance! Honey you still have time to enter the contest and win us a ring go for it. You never know! love to win it would look good on my finger. We are called engaged, 5 years, no ring. What gives???? Need that diamond badly and its beautiful. I would love to win this prize, so beautiful. I would love diamond posts for my ears to celebrate being a cancer survivor of 3 years and a heart attack survivor. It would also be a permanent reminder for my “Harley” who is my life saving adopted dog. They did an article about him in the newspaper 3 years ago ,as he found my cancer 2 weeks after I adopted him. My wife would love this prize. We are no longer young and do not have the money for nice things like we used to. I would like to see her enjoy this. I have never been married, but i would love to be able to give the ring to my son to give to his new wife, he couldn’t afford a good set but said some day my love i well replace this set with a real beauty, and i’d like to help him for she gave me the most wonderful gift, my new grand daughter and she is more beautiful then any ring but it would be nice for him to be able to do this for her. awesome thankyou for the possibility!! We celebrated our 30th wedding anniversary this past June 5;however, we were not able to celebrate formally. I wasn’t able to purchase a ring for my wife when we married, Truthfully, neither one of us have a wedding ring. We admire everyone else’s rings, but there’s always something that requires our money as a need. The diamond is perfect and the best wishes for the recipient. Gorgeous Jewelry. Thank you for the opportunity to possibly win such fabulously generous and gorgeous jewelry. Good luck to all. I WOULD BE GLAD TO WIN THIS AND PROUDLY TELL OTHERS THE COMPANY WHERE I WON THE DIAMOND AMND EVENTUALLY PURCHASE MORE. =). THANK YOU FOR THE OPPORTUNITY TO ENTER AND WIN! PRAYING I AM PICKED.